With the 2013 Cycling season nearly complete, I have decided to host a Store-wide Sale. While everything in the store will be on sale, the Sale features great deals on 2013 model year bikes. Some Bikes are special markdowns, and some are opportunity buys from bike supplier overstock. I made some great purchases and I am passing on the savings. 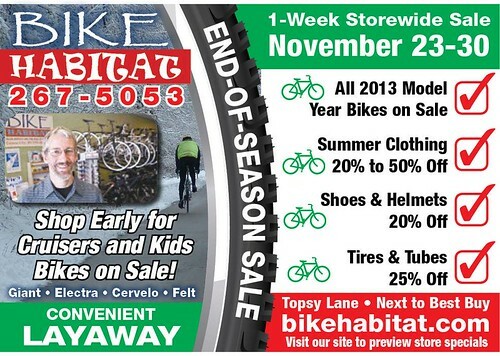 The Sale also features big discounts on summer clothing, helmets, shoes, tires & tubes, parts and accessories. The Store is Jam Packed with all sorts of great cycling gear. Everything is on sale. If you see a bike you like, we offer a very gracious Lay-Away program. This one week Sale will span two weekends, before and after Thanksgiving (Nov. 23 to Nov. 30). I know you will be in the area shopping, so please stop by, check things out, and maybe find a little something for yourself or another cyclist in your family. During the winter months we have repair clinics planed, a Super Bowl ride, and beginner group rides. For more up-to-date shop information follow us on Facebook and Twitter. For more information and an in-store coupon, CLICK HERE!